A New Jersey man who brought an unlicensed gun and police radio to the mall the night a gunman opened fire inside was arrested at the scene amid the chaos, NBC 4 New York has learned. 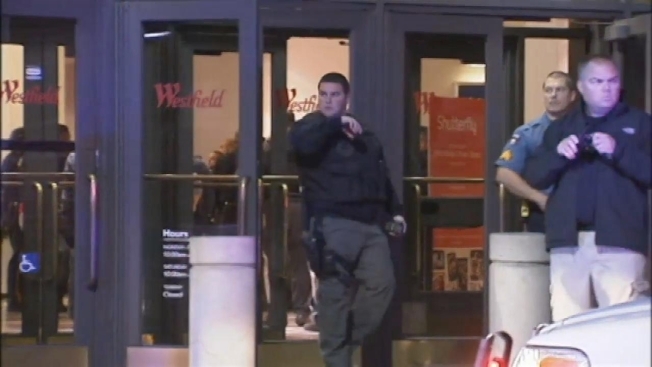 According to a police report, Detective Ronald Salzano was at the Westfield Garden State Plaza mall command center, about 90 minutes after the shooting began inside, when he noticed a man in a leather jacket and dark military-style pants and boots. Salzano, of the Bergen County Police Department, approached the man and asked for ID, given that he fit the description of the shooter, who at that point was still unaccounted for. A 20-year-old man wearing a motorcycle helmet and dressed in all black walked into a busy New Jersey mall minutes before it closed Monday night and began shooting, sending terrified customers running and trapping hundreds more in the building overnight as police searched for him. Brynn Gingras has more. The man said he was a veteran and volunteer paramedic and had responded to the mall after hearing about the shooting on the radio. The detective found a knife and loaded .45-caliber handgun on the man. He was later charged with unlawful possession of a weapon because he did not have a permit for the gun. The actual gunman was found dead of a self-inflicted gunshot wound hours later, inside the mall. No one was injured in the shooting but hundreds of people were trapped in the mall overnight as police searched for him. Some shoppers saw the gunman, and others heard the gunfire before they ran out of the Garden State Plaza on Monday night. Erika Tarantal reports.